Completion of cosmetology school opens the door to a variety of exciting career options in the beauty industry, including positions as hairdressers, barbers, nail technicians, estheticians, salon managers and makeup artists, amongst many others. One thing all of these careers have in common is they serve to help customers and clients look and feel their best. With such a wide range of job possibilities and potential schools, it is important for aspiring cosmetologists to select a program that will prepare them for the specific career path they hope to pursue after graduation and becoming a cosmetologist. Know you want to embark on a career in beauty but not sure which one might be right for you? Read on for details about the most popular jobs for graduates of cosmetology school. 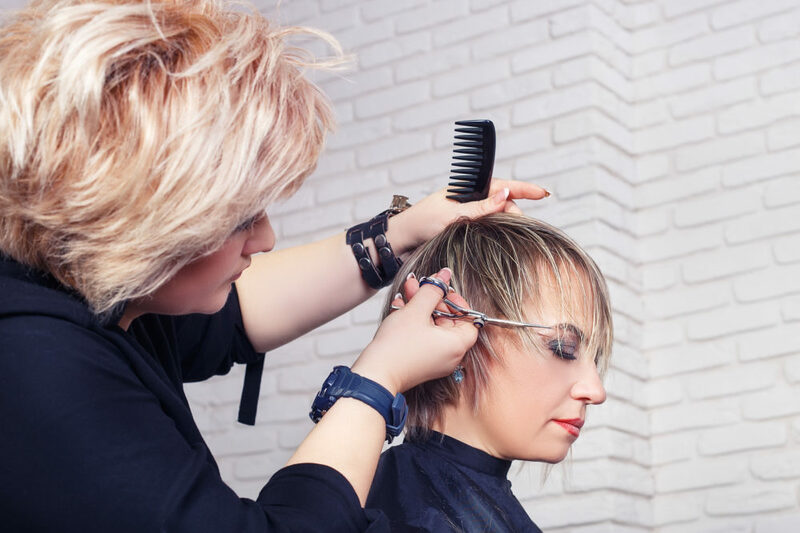 Hair stylists provide beauty services focused on hair care and styling, including shampooing, cutting, coloring and styling hair, as well as massaging and treating the scalp. Hair stylists and cosmetologists are trained to analyze customer's hair and other physical features and personalize recommendations for hair styles and beauty treatments to help clients look their best. Hair stylists may also demonstrate and sell hair care products, as well as assist in the management of a salon by making customer appointments and cleaning and sanitizing their work station and tools. Like hairdressers, barbers provide hair care and styling services but primarily for a male customer base. In addition to shampooing, cutting, coloring and styling hair, barbers also provide facial hair services such as trimming beards and shaving men's faces and necks. Also known as manicurists and pedicurists, nail technicians provide a number of nail services to clients including cleaning and shaping client's fingernails and toenails, applying artificial nails, gel nails, hand and foot massage, hot-oil therapy and nail polishing and decorating. According to the U.S. Bureau of Labor Statistics, employment of manicurists and pedicurists is projected to grow 12 percent from 2016 to 2026, faster than the average for all occupations, creating new job opportunities for aspiring nail artists. Estheticians, or skincare specialists, provide clients with a myriad of skincare treatments to improve skin health, reduce signs of aging and fatigue and improve overall appearance. Skin care specialists are trained to assess the condition of the client's skin and provide tailored recommendations to improve skin quality. Treatments may include cleansing and exfoliating facials, waxing and hair removal, laser treatments and chemical peels. Estheticians also often educate their clients on proper skincare and recommend appropriate skincare products. Makeup artists help clients achieve a desired look or appearance through the application of cosmetic products. Makeup artists can specialize in a number of areas, including stage or theatrical makeup for actors and models in the entertainment industry, bridal and special event makeup, cosmetic product sales and marketing, department store cosmetic counter demonstrations, or providing in-salon makeup consultation and application services. Makeup artists may also specialize in the application of permanent makeup and/or false eyelashes. Trained massage therapists perform therapeutic massages of soft tissues and joints for their clients. They may perform full-body treatments, as well as those focused on specific areas of the body, such as the back, scalp or feet. Massage therapists are educated in various massage techniques, such as Swedish massage, deep-tissue and prenatal, as well as in reflexology and aroma therapies. Massage therapists can assess client's range of motion and muscle strength and propose treatment plans and exercises to stimulate healing, strengthening, relaxation and overall wellness. Combining a career in cosmetology with running a business, salon and spa managers coordinate the day-to-day running of their place of employment. Key job duties include scheduling, training and supervising staff, scheduling guest appointments and maintaining client databases, performing accounting duties and developing marketing strategies and selling products and services. In addition, the spa or salon manager is responsible for ensuring customer satisfaction by responding to customer questions and complaints and instituting customer appreciation programs. Whether your dream is to become an esthetician, hair stylist or to own your own salon one day, there is a beauty industry dream job waiting for you once you've earned your cosmetology school certification/diploma. Learn more about working as a cosmetologist.